Generally, people think they don’t need much time to pack clothes for moving. Unfortunately, this isn’t entirely true. Although your clothes can’t break or get seriously damaged during the transport, you can’t just put them in bags or boxes and consider the job done. To pack clothes for moving, you need to deal with a bit of planning, categorizing your clothes, providing packing supplies, packing and labeling boxes, etc. So, as you can see, it will actually take some time. To help you finish this task successfully, here are a few tips on how to pack clothes for moving. Your clothes should be clean and dry. Packing dirty or stained clothes is a no-no. 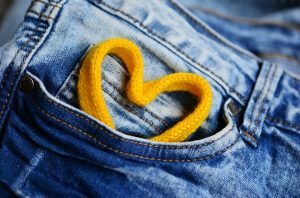 You should get rid of those items you don’t wear anymore. They can be torn, worn out, outdated or outgrown. This means that decluttering home before moving is the step you can’t avoid. You should take all your clothes from closets to be able to categorize them later on. In case of the lighter clothing items, like socks or underwear, you should consult your movers first. If they don’t plan to disassemble your dresser, you could leave these items where they are, in the drawers. Do the necessary preparations before you pack clothes for moving. To pack clothes for moving efficiently, you need to categorize your clothing items first. The criteria for determining categories can be different. They will depend on your preferences, the distance of your new home or the amount of your clothing. Here are some suggestions. This is a good thing to do because different fabrics have different characteristics. For example, some fabrics, like silk, are susceptible to creasing and they need to be treated differently from those, like polyester, which almost doesn’t crease at all. This way, you will know which boxes to unpack first when you get to your new home. 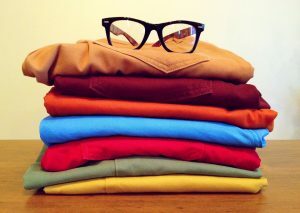 Categorizing your clothes by seasons means that you can pack in advance all those items you aren’t wearing at the moment. For example, if you move in spring, all your winter and fall clothes can be packed well in advance. You can keep some of your summer clothing items at hand if the weather gets hot. Combine all your large clothing items like jackets, coats, sweaters, etc. together. On the other side, combine small items like T-shirts, shirts, shorts, pants, skirts, etc. together. This is particularly convenient in case of a quick move. Then, you need to be efficient and quick to pack clothes for moving on time. So, all t-shirts should go together, as well as pants, or sweaters or jackets, etc. Once you have prepared your clothes for packing and divided them into categories, you will know the type of packing supplies you need to pack clothes before moving. Read on about some potential supplies you might use. You can be presented with a dilemma of whether to use free moving boxes – yes or no? When it comes to clothes, these boxes should be clean and strong enough to handle the load. Remember not to underestimate the weight of your clothes. Maybe using more small boxes is a better option than using fewer but big boxes. These are convenient for packing your suits and costumes, shirts and dresses, or elegant pants. Use them if you can afford them. These are tall, cardboard boxes with handles on both sides. Also, they have a hanging rack at the top. Simply perfect, isn’t it? Yes, using your luggage is an excellent solution for moving them and the clothes at the same time. 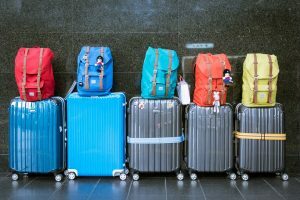 Those suitcases with wheels are particularly useful because you can maneuver them easily. Your reliable movers like Miami Movers For Less won’t have any problems when loading or unloading these from the moving vehicle. Suitcases with wheels are very useful for packing your clothes for the move. These aren’t very strong, but they are convenient to protect your clothes during transport. Just make a hole at the bottom of the bag big enough for a hanger to go through. Then, tie the bag at the bottom and your clothes are safe. These bags have one significant advantage which makes them different from other packing supplies. They provide you with additional space, which is very important when moving. The principal aim when packing clothes is to be efficient and neat in order to use your packing supplies to the maximum at the minimal space. First of all, put aside the clothes you will be needing during the first few days at your new home. These items should be packed separately and included in the essentials box. Then, deal with the rest of your clothing items. Fold each of the items neatly and tightly, preferably inside out, to protect them better. Start packing them into boxes, heavier items at the bottom and lighter at the top. Understandably, delicate clothes require more attention, so hang them in wardrobe boxes carefully or leave them on hangers protected with garbage bags. This is an alternative to standard folding of clothes. First, you need a large clothing item. This could be a jacket, a coat or a big sweater and you should put it on a flat surface. Secondly, put other clothing items one by one from the biggest to the smallest on this large item. Finally, take one end of the jacket, coat or sweater into your hands and roll until all the items form a bundle. To secure it further, a few rubber bands will do. To pack clothes for moving successfully you need a good plan and a proper organization. Don’t take this stage of your move for granted. Otherwise, you will have to deal with some space issues once your movers start loading things on their truck. Pack your shoes and hats separately from your clothes. You will need some more boxes for that. Luckily, reliable movers are always there to help you. As the move is coming to its end, start thinking about how much to tip movers and show appreciation for what they have done for you.